3BR Silverthorne Townhome Near Ski Resorts! Look forward to incredible mountain views and a prime location near numerous ski resorts and hiking trails when you book this 3-bedroom, 2.5-bath vacation rental townhome in Silverthorne! Situated just minutes from ski resorts, hiking trails, and mountain towns, this home offers 12 guests a great home base for all-season Rocky Mountain exploration. After your daily adventures, return to this cozy home to kick back and relax on one of 2 spacious decks while admiring the mountain views. Surrounded by Aspen and pine trees, the decks will undoubtedly become your favorite spots to spend your mornings and evenings at this Silverthorne townhome. Sip your coffee while sitting back on the chairs and looking out on the marvelous views of Dillon/Frisco lake and the mountains. When you’re able to pull yourself away from the views, step inside the 1,800-square-foot townhome to make yourself at home in the modern living area. Settle down on the comfortable red sectional and turn on the flat-screen Smart cable TV to watch a movie with your travel companions. Prepare a hearty breakfast for the whole group in the fully equipped kitchen, complete with stainless steel appliances and ample counterspace that makes cooking a breeze. Serve your meals at the charming dining table with seating for 6 beneath the lovely chandelier. 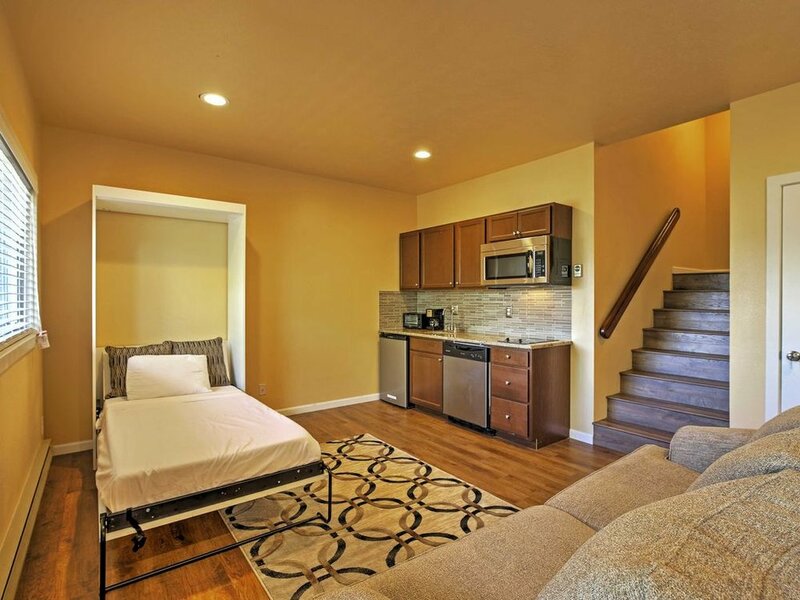 More space for relaxation can be found in the basement, which offers another living area with a Smart cable TV, a Murphy bed, and a well-equipped kitchenette with stainless steel appliances. After each eventful day, rinse off in one of the 2 full, pristine bathrooms before choosing a bed to rest your head. Both master bedrooms have king beds, while the third bedroom has a twin bed and twin-over-twin bunk bed. Additional sleeping can be found on the daybed in the study room or the murphy bed and sleeper sofa in the basement. 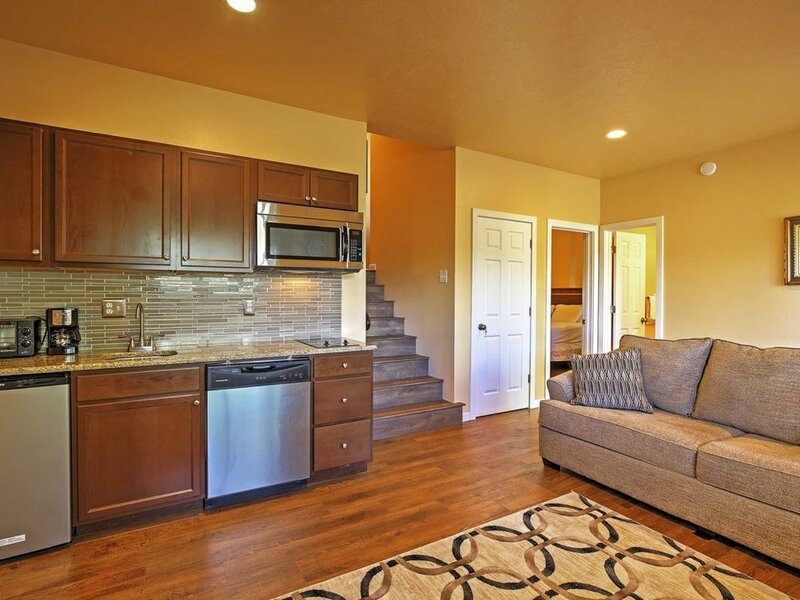 Perhaps the best part about this townhome is its prime location, perfect for your next ski trip or summer adventure! During the winter, shred some fresh powder at the nearby ski resorts, including Loveland, Keystone, Breckenridge, Copper Mountain, Vail and Beaver Creek! Summertime calls for hiking trails, which can be found right outside the front door, like Buffalo Mountain hiking trails, just a 5-minute walk up the hill. Fishers, bring your rods, as there is a freshwater river just a 5-minute walk from the home. Lake Dillon is also just minutes from the property, so you’ll have plenty of fishing opportunities nearby. On laid-back days, go shopping at the nearby outlets, or find the perfect souvenir at any of the nearby mountain towns, including Breckenridge, Frisco, and Vail! - Great Silverthorne location - Easy access to hiking trails, ski resorts, fishing, and shopping!